Easy Rack work tables are designed with ergonomic maneuverability, worker safety, and efficient process flow in mind. Our sales philosophy is based on what the table does to make you the most money in the safest, fastest way. Call one of our applications expert to see just which model is ideal for your unique operation and process flow demands. Work tables let one worker handle what used to take two or more workers. It is now possible for single individuals to handle long work pieces and work on long assemblies thanks to new ergonomic designs and innovative methods of lifting and positioning. These super ergonomic work tables help reduce risk of back injury. You can operate them with precision lifting and tilting controls. Easy Rack has models that handle weight capacities of, of up to 12000 lbs of vertical lift. We also have other designs intended for hand pallet truck accessibility in mind. Many environments, such as food and pharmaceutical companies, require sanitary wash down equipment. Stainless steel lift tables are ideal for these environments. Four easy rolling casters make these lift tables easy to maneuver. An internal DC power unit carries and integral charge to pushbutton controls that workers use to raise and lower loads. Take advantage of shop air when it is available with pneumatic lifts. These tables can operate on as little as 80 p.s.i. and handle loads of up to 4,000 lbs. Tandem lift tables are ideal for handling exceptionally long loads. Examples include lumber, pipe, bar stock, sheets, and assemblies. Extra wide and extra long platforms are used by tube welders, formers, and panel saw operators as feeding tables and for bundling lumber, pipe, and bar stock. You can set up to 1 million different lift configurations with these tables. These are back saving tables made to help you with lighter loads. These lifts have separate controls for lifting and tilting so you can precisely position equipment. 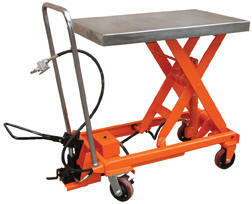 These work tables are for perfect for loading and unloading processing machines. You can use them as standalone devices, or you can use them with other items such as shaft pullers and transfer cars for a complete roll handling system. Cam lift tables can elevate up to 30,000 pounds and feature minimum height clearances. Floor height lifts can be lowered to floor or near to the floor and offloaded by hand onto pallet trucks. These lifts can elevate up to 12,000 lbs. This table moves around, so applications that require a lift table in different places can be quickly accessed and performed by one person.